Newcastle United are well clear of the relegation drop in Premier League and a big help in that had a Venezuelan striker. Salomon Rondon joined the Magpies on loan from West Bromwich Albion last summer and never looked back. 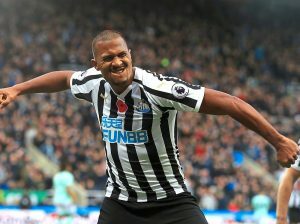 In 26 Premier League appearances since joining Rafa Benitez’s side, Rondon scored nine Premier League goals and added important five assists, to prove he is their most important player this season. Therefore, Newcastle are seriously considering signing Rondon on a permanent transfer. According to The Mail, Newcastle are ready to pay as much as £12m for the striker, but not more than that. Rondon’s buy-out clause in his current contract with West Brom is £16.5m, which is a bit over what Magpies are ready to pay. Considering his importance in the team this season, it looks like that is not to big of a hike in price, with Newcastle set for another season in Premier League. However, Rondon soon turns 30 and will have only one year left on his contract this summer.